The quantity of motion possessed by a moving body is known as momentum of the body. Momentum is a vector quantity and the direction of momentum of a body is same as that of the direction of the velocity of the body. Newton’s second law states that, the rate of change of momentum of a body with respect to time, is directly proportional to the force acting on the body and the change in momentum takes place in the direction of applied force on the body. Newton’s second law of motion gives the relationship between the force applied on a body and the acceleration produced in the body. Force can be measured by using Newton’s Second law of motion. (ii) A large acceleration is produced in a body of small mass, while a small acceleration is produced in a body of large mass if same force acts on both the bodies. Hence the force is said to be 1 Newton, if its produces 1 m/s2 acceleration in a body of 1 kg mass. Hence, the force is said to be 1 dyne, if it produces 1 cm/s2 acceleration in a body of 1 g mass. Newton’s third law of motion states that, to each and every action, there is an equal and opposite reaction. The weight of the block acts vertically downward. This weight of the block is known as the action and it acts on the surface of the table. The surface of the table exerts an upward force on the wooden block. 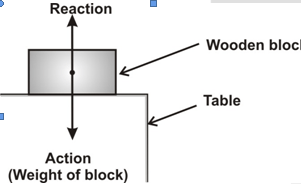 This upward force acting on the wooden block is known as reaction. Thus we find that action and reaction act on two different bodies. When a ball strikes against a floor, it exerts a force (known as action) on the floor. According to Newton’s third law of motion, the floor exerts an equal and opposite force (known as reaction) on the ball. Due to this reaction, the ball rebounds. According to Newton’s third law of motion, action and reaction are always equal to each other. But they can not cancel out each other because they act on different bodies.